The history of the Jews in Central Asia dates back centuries, where Jews have lived in countries including Kyrgyzstan, Kazakhstan, Mongolia, Uzbekistan and Tajikistan. In Kyrgyz tradition, the term "Djeet" was used in order to describe Jews, and it is mentioned in the Kyrgyz epic poem Manas, which dates back to the 10th century CE. In Manas, several central-Asian cities are described as having Jewish communities in them, among them Samarkand, Bukhara and Baghdad, though none of them have ever been inhabited by a majority of Kyrgyz people nor included in a Kyrgyz territory. Bukharan Jews, also known as "Bukharian Jews" or "Bukhari Jews" are Jews from Central Asia who speak Bukhori, a dialect of Tajik (Persian). Their name comes from the former Central Asian Emirate of Bukhara, which once had a sizable Jewish community. Since the dissolution of the Soviet Union, the great majority have emigrated to Israel and to the United States, while others have emigrated to Europe or Australia. After World War I, more and more Ashkenazi Jews came to Kyrgyzstan. Among them many representatives of different political parties who were exiled to central Asia, or government officials who were asked to work in rural areas such as Kyrgyzstan. With the outbreak of the October Revolution, many political activists were sent to Kyrgyzstan to promote the communist ideas − many of whom were Jews or of Jewish origin, such as G. Broido who was chairman of the Bishkek city soviet, and Pinchasov, Lifschitz and Frei who were members of the local city soviets of Osh, Djahlal-Abad, and Tokmak. In 1920 the local ministry of education initiated a Jewish institute run by Simon Dimanshtein meant for alphabetization of Sephardic Jews. In 1929, Alexander Volodarsky, a former Yeshiva student from Vitebsk, became the leader of the Ashkenazi Jewish community of Osh, after being exiled from Belarus due to his religious practices. By 1945, some 70 Jews of the Bishkek community visited the local synagogue daily. On holidays, some 2,500 Jews visited the synagogue. Later, the synagogue began to host also Sephardic prayers for the city's Sephardi community. During the 1950s, the Jewish community of Bishkek reached about 3% of the total population of the city. Jews became dominant in the local university, clinics and schools, living mostly at the center of Bishkek. On other cities, smaller communities of Jews had lived also in the center mostly. During the 1970s, some Jews began to emigrate to Israel, though the Soviet government made it hard for them to emigrate. Later on, and especially from 1989 and on, the vast majority of the Kyrgyzstan Jewish community emigrated to Israel, leaving around 500 Jews living nowadays in the country. Kazakh Jews have a long history. There are approximately several thousand Jews in Kazakhstan right now. Most Kazakh Jews are Ashkenazi and speak Russian. General Secretary Joseph Stalin forcibly moved thousands of Jews from other parts of the Soviet Union to the Kazakh SSR. During the Holocaust 8,000 Jews fled to Kazakhstan. Yeshaya E. Cohen, the Chief Rabbi of Kazakhstan, told Kazinform on January 16, 2004 that a new synagogue would be built in Astana. He thanked President Nazarbayev for "paying so much attention to distinguishing between those who truly believe and those who want to hijack their religion." President of the Euro-Asian Jewish Congress, presented Nazarbayev with a menorah on 7 September 2004. Kazakhstan's Jewish population rapidly increased between 1926 and 1959, being almost eight times larger in 1959 than in 1926. Kazakhstan's Jewish population slowly declined between 1959 and 1989, followed by a much larger decline after the fall of Communism between 1989 and 2002 due to massive Jewish emigration, mostly to Israel. According to the National Coalition Supporting Soviet Jewry, "Anti-Semitism is not prevalent in Kazakhstan and rare incidents are reported in the press," contrary to incorrect perceptions in popular culture caused by the country's fictional portrayal in the 2006 film Borat as a "hot-bed of anti-Semitism." Before 1920, most Jews that arrived in Mongolia were of Russian background, and had fled the chaos of the Russian Civil War. Some were even elevated to Mongolian nobility as was the case of Zanzer who changed his name in honour of Zanabazar, the first Bogd Khan. Unfortunately, the community was deported from the country after 1921. In 1925-6, a Russian-Jewish journalist came across a community of 50 newly settled families in a remote region of Outer Mongolia approximately 300 kilometres (200 mi) from the Manchurian border. In 1926, Ulan Bator had a population of 600 Russian Jews who had attempted to leave Mongolia. A number of Jews left the country in search of better economic opportunities. Some left for Israel, which had a visa agreement with Mongolia. The Jewish population numbers less than 100. The closest Jewish community with a rabbi is the Siberian city of Irkutsk, whose Chief Rabbi Aharon Wagner wants to maintain close contact with the neighboring Mongolian Jewish community. Jewish children with their teacher in Samarkand. Photograph taken by Sergey Prokudin-Gorsky sometime between 1909 and 1915. 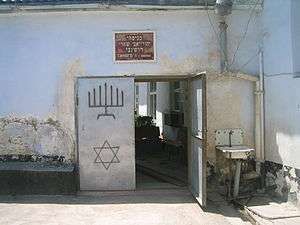 Uzbek Jews have two distinct communities; the more religious and traditional Bukharan Jewish community and the more progressive, European-in-origin Ashkenazi community. There were 94,900 Jews in Uzbekistan in 1989, but fewer than 5,000 remained in 2007 (most of them in Tashkent). There are 12 synagogues in Uzbekistan. Tajikistan's Jewish population was almost non-existent in 1926, but it increased rapidly between 1926 and 1970. In 1970, Tajikistan's Jewish population was more than 50 times larger than it was in 1926, numbering almost 15,000 people. Tajikistan's Jewish population continued growing between 1970 and 1989, but at a much slower rate. Since the collapse of Communism virtually all of the Jews in Tajikistan left and moved to other countries between 1989 and 2002. Most of the Tajik Jews who emigrated moved to Israel. Old Synagogue, Dushanbe (main entrance), as seen in June 2006, two years before demolition. As of 2006, the Dushanbe synagogue was the last remaining synagogue in the country, and was actively being used for worship. However, the Tajik government ordered the local Jewish community to vacate the synagogue, which was going to be demolished for a new presidential palace. After the destruction of the community's mikvah, kosher butcher, and several classrooms in February 2006, the demolition was temporarily halted due to protests from the Israeli and U.S. embassies, as well as from worldwide Jewish communities. The synagogue was finally razed by municipal court order in the end of June 2008, and the community was allocated a site in the western part of Dushanbe to build a new synagogue with financing from international Jewish organizations and private donors. Because of this incident, many Israelis and Americans of Tajik Jewish descent have negative views toward the Government of Tajikistan. ↑ admin. "New Kazakhstan Jewish Center revitalizes ex-USSR community". ↑ "ShalomR53.pmd" (PDF). Retrieved 2013-04-14. 1 2 3 4 "tab30.XLS" (PDF). Retrieved 2013-04-14. 1 2 3 "Приложение Демоскопа Weekly". Demoscope.ru. 2013-01-15. Retrieved 2013-04-14. 1 2 3 "Powered by Google Docs" (PDF). Docs.google.com. Retrieved 2013-04-14. ↑ YIVO | Population and Migration: Population since World War I. Yivoencyclopedia.org. Retrieved on 2013-04-14. 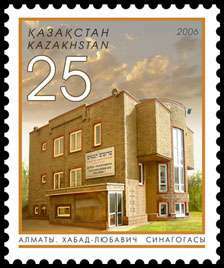 ↑ "Ohr Avner Chabad - Almaty, Kazakhstan". Chabad.org. Retrieved 2013-04-14. ↑ World Jewish Population 2001, American Jewish Yearbook, vol. 101 (2001), p. 561. ↑ World Jewish Population 2007, American Jewish Yearbook, vol. 107 (2007), p. 592. 1 2 "YIVO | Population and Migration: Population since World War I". Yivoencyclopedia.org. Retrieved 2013-04-14. ↑ David Levinson (1998). Ethnic Groups Worldwide: A Ready Reference Handbook. Greenwood Press. ISBN 1-57356-019-7. 1 2 3 "Tajikistan: Virtual Jewish History Tour". Jewishvirtuallibrary.org. 2006-03-01. Retrieved 2013-04-14. ↑ Estimated Jewish population in Asia as of 1 January 2002. Retrieved on 9 June 2009. ↑ "Tajikistan: Virtual Jewish History Tour". Jewishvirtuallibrary.org. 2006-03-01. Retrieved 2013-04-14.